White Light returns to the annual PLASA London exhibition in 2013, held for the first time at London’s ExCel Centre. 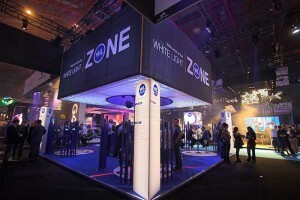 As in previous years, the White Light Zone will serve as home base for the latest lighting, effects, and media control technology from exclusive manufacturers. The company will also showcase enhanced White Light services for 2013, including its in-house custom colour service, expanded training programme, and improved product support. The White Light Bar, a PLASA London tradition, will form the centre of the White Light Zone on Stand F50. Three products in the White Light Zone will be featured in this year’s PLASA Awards for Innovation: the Altman Phoenix LED profile and UV Spectra Cyc fixtures, as well as the JB Lighting Sparx 7 LED wash fixture. ADB Lighting (E50) will exhibit for the first time in the White Light Zone, since recently partnering with White Light to distribute ADB products throughout the UK. ADB will display their Eurodim Twin Tech dimmers – recently installed at English National Opera’s London Coliseum. Also on display will be the ADB Liberty, Freedom, and Imago control desks. Altman Lighting (F40) celebrates its 60 year anniversary with the debut of the LED Phoenix profile along with a UV version of the company’s popular LED Spectra Cyc. Both are nominated for the PLASA Awards for Innovation. ArKaos Pro (E56) will deliver the latest addition to their media server range with the 4 output Studio Server, designed to provide high performance video and effects for the demands of the studio, concert touring, television and corporate applications. Chromlech (F39), maker of the unique Elidy panel which launched at last year’s PLASA Show, is back again with the release of V2 Elidy software (including new animation features) and the launch of the Elidy Strip 5 & Strip 15 units to complete the Elidy range. CORE Lighting (G50) - known for their range of completely wireless, outdoor rated, LED uplighters, will showcase the new ColourPoint uplighter, the company’s lightest and most cost effective solution yet, perfect for creating stunning interior and exterior events spaces. Also in the White Light Zone, Interactive Technologies (F59) will showcase the Cue Station and Cue Server products, which provide customizable remote lighting programming and playback. JB Lighting (E60) will display their new Sparx 7, a complement to their A8 and A12 LED moving wash range. The Sparx 7, which is nominated for the PLASA Awards for Innovation, is equipped with 19 multi-chip RGBW LEDs and has a 4 to 40 degree zoom range. For those looking to upgrade existing tungsten profiles, the new HPLed from Lites (F60) provides a perfect solution. Easy to install, long lasting, and maintenance free – the HPLed is a simple and cost effective LED retrofit designed to upgrade fixtures using HPL lamps - without tossing out valuable existing equipment. Look Solutions (G56) brand of high quality special effects equipment has become industry standard. On display will be the popular Tiny Series compact foggers, Unique hazer, and Viper power fogger. LSC Lighting (G60) joins the White Light stand again this year to promote the LX series lighting control consoles with built-in Clarity software providing intuitive features like rig view and media server integration. Also on display will be the popular LSC Redback dimmers for both portable and installation applications. Wireless Solutions (G40) will showcase their exclusive W-DMX technology with the G4 Blackbox and G4 Whitebox transceivers for indoor and outdoor use, respectively. White Light (E40) staff will be on hand from all departments including hire, sales, events, and installations to answer questions, give demonstrations, and discuss upcoming projects.